Let's just get the ball moving down the line. Give the player at the start of one of the lines a ball, tell the line to advance using lateral passing - with the last player in each line passing the ball to the first player in the opposite line. Every passer must follow their pass, making themselves available as a support runner for the ball carrier. A ball carrier with a support runner has two options - a backwards flick to the support runner - or to pass the ball out to the next receiver. They may also have an additional option back inside, but best to keep it simple to start with. 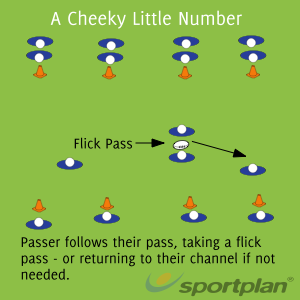 If a support runner receives a flicked pass, they can run with it and pass it to the next player down the line. The passer of the ball becomes the support runner. If the support runner does not receive a flick pass and the ball is passed from the player they are supporting, they should return to their original channel. In the case of a support runner becoming the next passer - they should follow their pass - and the other players should reorganize the line - not fixating on maintaining their original position in the line. Players should change positions in the line following each attack. Don't feel that you have to focus on all of the following coaching points, you may have your own. Select the points that most closely match your overall training and session goals. Players should work to keep the tempo of the session high. Receivers hands should be out, presenting a target. Ball carriers carry the ball in two hands. The pass is weighted in terms of distance, speed, and accuracy. The pass is only complete when caught. Players do not spin the ball over short distances and their pass should be sympathetic to the receiver. Ball carriers pass to where the receiver is going to be, not where they are. Ball carriers provide a flat ball or a ball that the receiver can run onto. The receiver attacks at pace, receiving the ball while moving forward at pace. Players demonstrate good communication. Communication should be efficient, effective, and encouraging. Receivers should identify themselves, their location etc. Ball carriers should verbally seek out support. Mistakes will be made, allow your players the freedom to make mistakes without feeling a failure. Passing should be off both hands. There is no weak or strong hand, just hands that need a little more work. Work is the key, not talent. Passers run in support of their pass, this will be important to provide the ball carrier with options. The passers job is not finished when they make a pass. Ball carriers should be aware of their support: the support runners position etc. Players that have gone in support realign after their supporting roll is complete. The means that they return to their original channel, retreating to provide them with enough depth for the next phase of attack. Players should realign without being fixated on their original position - if they have to move in one position or push out one - do it. If the ball carrier wishes to make a backwards flick pass: they should move their passing hand to the upper point of the ball rotating their wrist backwards in a low and arching motion - finishing with their passing hand toward the target. The pass should hand hang time, rather like a pop pass. Allow players to be creative. The attack must maintain width and depth. Players should understand why a support runner is useful, draw this out by questioning players - not by telling them. You can progress this by having the ball move up and down the line (2 sets of lateral passes in opposite directions). 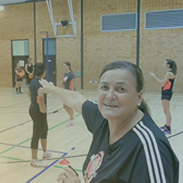 Note:�This drill is not an end in itself, it needs to be used in conjunction with other drills to build up a form of attack - during which support runners are evident. Build on this to help your players use support runners to keep defences guessing, and to break them down.